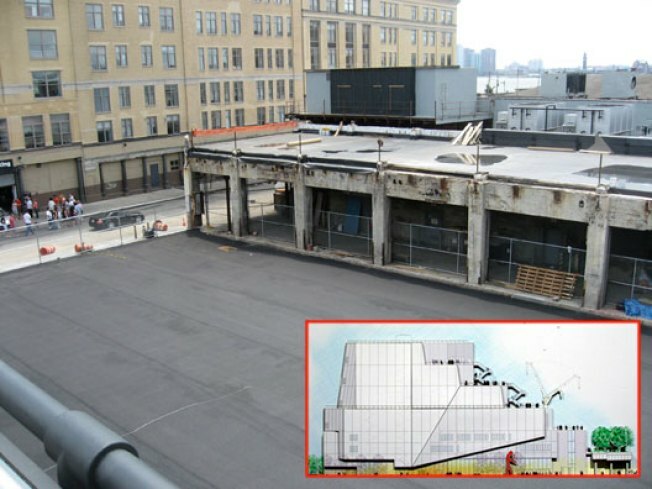 The proposed location for the Whitney, High Line edition. The Whitney Museum of American Art has reportedly inked an deal to build a second museum at the entrance to the High Line park in the Meatpacking District -- part of the city's ever growing effort to bring more money and business to the area. The Whitney reached a tentative agreement with the city in 2006, and last month it signed a contract with the New York City Economic Development Corporation to buy the city-owned site at Washington and Gansevoort Streets for $18 million. That's about half the sites appraised value, the New York Times reported. For the city, the addition of a Whitney downtown is another magnet to draw people to an area that began its crossover with bars and clubs, and is now home to some of the city's most exclusive hotels, condos and retail. “We think this is a great anchor to this cultural district,” Seth Pinsky, president of the New York City Economic Development Corporation, told the Times. “It will provide a gateway to the High Line. The two are complementary." The Whitney, one of the world's leading collectors of 20th and 21st century American art, has four years to close on the purchase of the land and five years to begin construction on the new building. The new site will be double the size of the first building and designed by Renzo Piano. It will make nonrefundable monthly payments of $50,000 to the city until the closing date, which has not been determined. These payments will be credited toward the purchase price and the balance of the $18 million is due at closing. The Whitney's signed contract comes three years after the Dia Art Foundation scrapped its plans to open a museum next to the High Line entrance. That’s when the Whitney stepped in and reached a conditional agreement to take over the space, the Times reported. Adam D. Weinberg, the Whitney’s director, said the money for the project would come from capital funds, not the operating budget. “The two are separate,” he explained to the newspaper. There are also questions about how the Whitney will afford to run two sites at once. The museum plans to sell five town houses next to its UES building on Madison Avenue and 75th Street when the market improves to help fund the downtown expansion, Curbed reports. The Whitney has long wanted to expand in its landmark home -- the 1966 Marcel Breuer building -- to accommodate larger collections or contributions. Most of the building's space is devoted to special exhibits. Cost considerations forced the museum's executives to scrap those plans for a second, satellite location. But in this economy, paying for the High Line site will be a challenge. In May the museum announced a fund-raising campaign of $680 million: $435 million for the new building and about $245 million for the endowment, the Times reported.